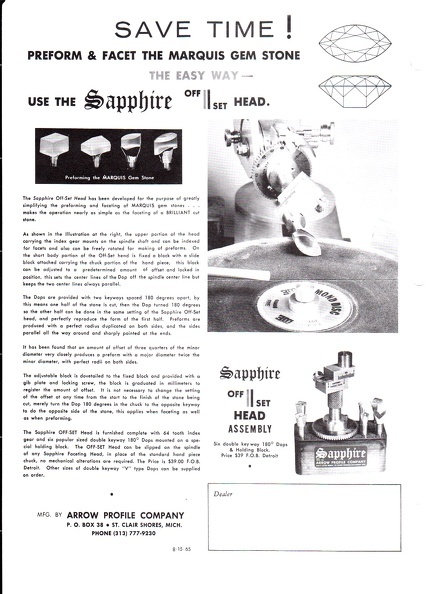 Beginning January 1966 through at least September 1972, The Arrow Profile Company of St. Clair Shores Michigan published "The Facetier" - a 4-6 page newsletter to promote their faceting machine, The Sapphire Faceting Unit. They supposedly sold for $0.25/issue but were mailed to me for free back when I was going to become the world's finest facetier. 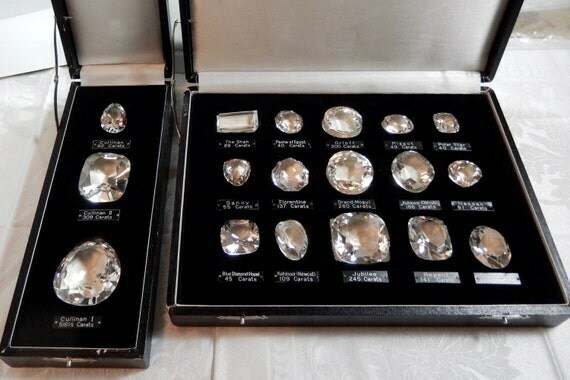 I planned on starting on cutting replicas of the world's most famous diamonds. FACT: Pure daydream. 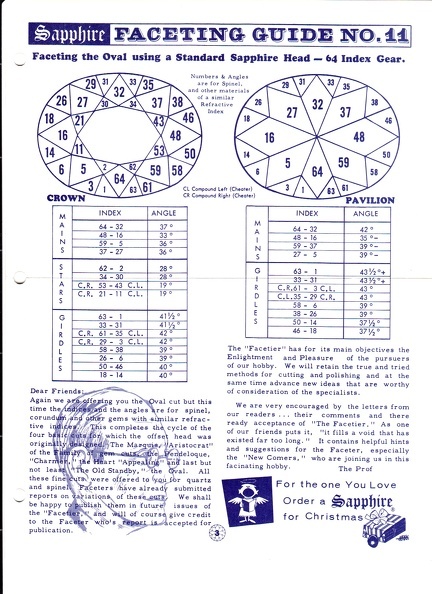 I never bought a machine or faceted a single stone. Too busy raising a family of 7 children. The newsletters have valuable information if anyone is interested. Very cool. It's amazing how the machines are still almost identical to what's available today. Few more bells and whistles now, but they obviously got the design right quite some time ago. 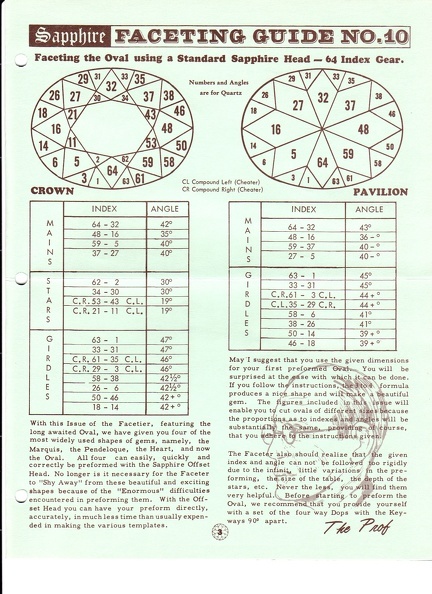 "It is to be understood that the figures and angles given here are for the purpose of being a close guide and that they might be subject to slight variations." 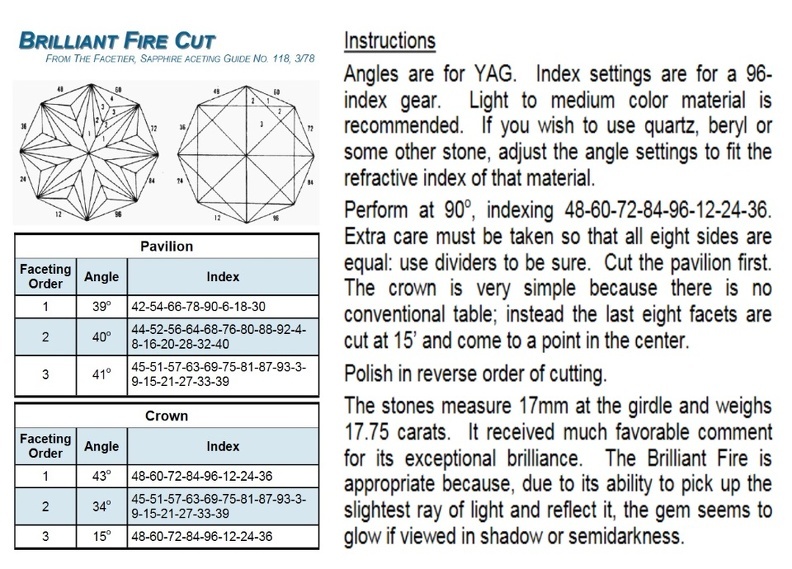 Thats written on the "Marquis" cut instructions, probably best if you want to do this to proof cut it in Gemcad first and get the angles right. 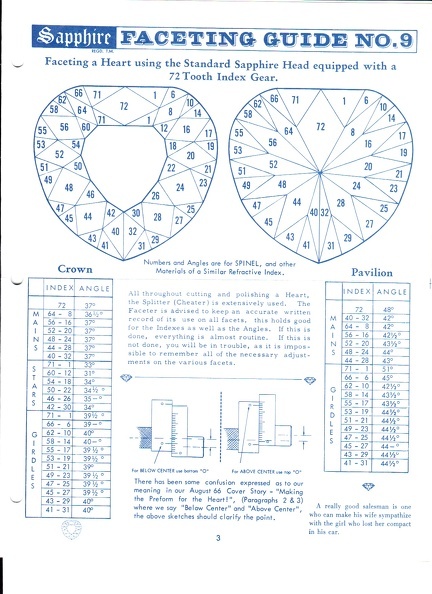 Its the same with a lot of these early diagrams, they must have been b******s to cut, probably put a lot of people off faceting for life. A great read. Don't remember if it was paper or internet. He even found moulds/castings of the precursor to the Hope and was able to measure and cut those. Yeah, same guy! He is amazing. persistent. Persuasive. Clever. Creative and extremely talented. 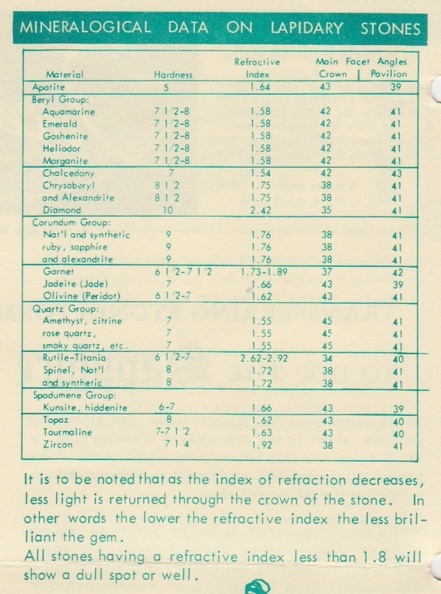 These figures are given for Spinel, Garnet, Corundum, and other materials of a similar refractive index. Perhaps it is an age perspective thing. What you consider "early diagrams" I consider "late." 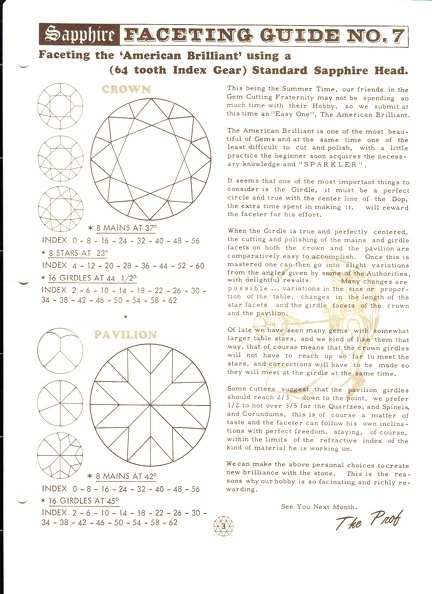 Louis de Berquen is best known for his introduction of absolute symmetry, improvements in the polishing process, and the development of the pendeloque shape. He is also credited with the development of the horizontally mounted metal grinding wheel. SUPPORT AND UPGRADES ARE STILL AVAILABLE FOR XS3 OWNERS. Upon Graves purchase of the XS Product, designs, and rights, I left the faceting machine business As part of the legal Agreement. However, I support the existing 80+ original XS3 machines. 1: Micrometer head adapter for the very early machines with a simple knurled Screw for angle fine adjust. They are made of metal, as experience has shown the BW Meter is superfluous in a .01° machine. These do fit the current Graves 5XL. Made of metal, they have less elasticity than the insulator-type OEM that allowed the use of a BW meter. Disassembly and reassembly and recalibration required. About one week turnaround. 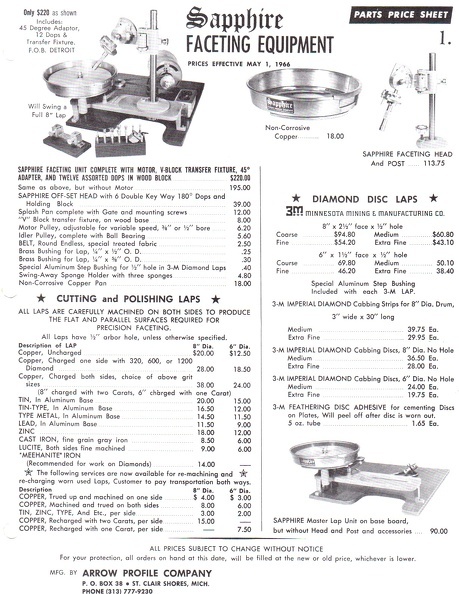 Here is a list, in no particular order, of all faceting machine manufacturers that USFG members have found and submitted. The list includes contact information and a link to their website (if they have one). Inclusion on this list is not an endorsement. If you know of other manufacturers (past or present) please let us know. 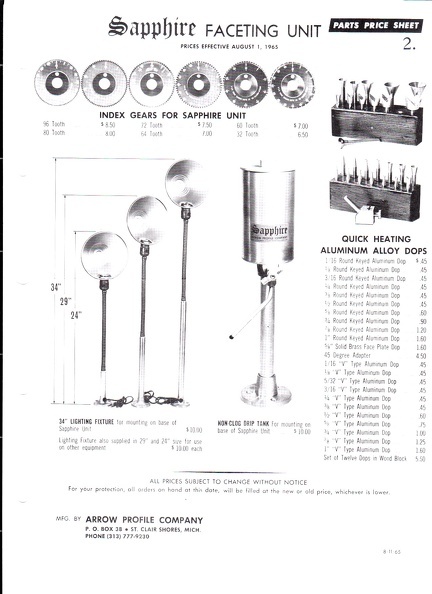 We’d appreciate any information on the manufacturer and/or photographs (physical or electronic versions). 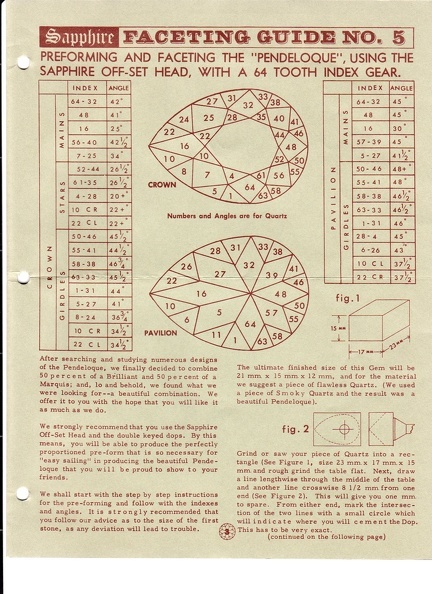 For those interested in building their own faceting machine, complete instructions for a very solid home-built machine can be found at Jon Rolfe’s website. Note: Thanks to Doug Miller for donating a large portion of the information on this webpage. Description: Manufactures a line of mast faceting machines and accessories. The O.M.F. 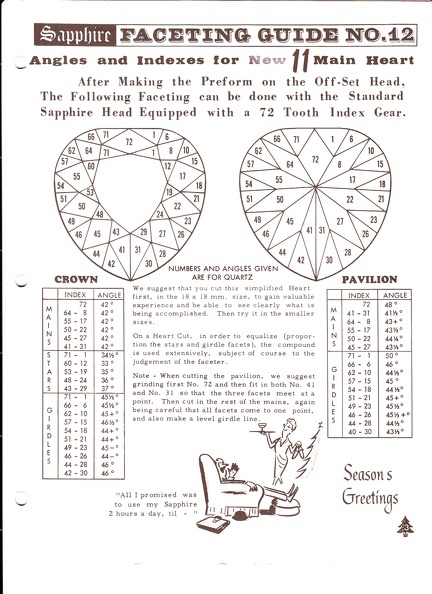 machine is a patented special cut machine for cutting concave facets. Description: Manufactures a solid faceting head and laps. Description: I believe that these machines are no longer in production. Description: Commercial faceting machines with dual arbours. Description: Sold only through dealers. 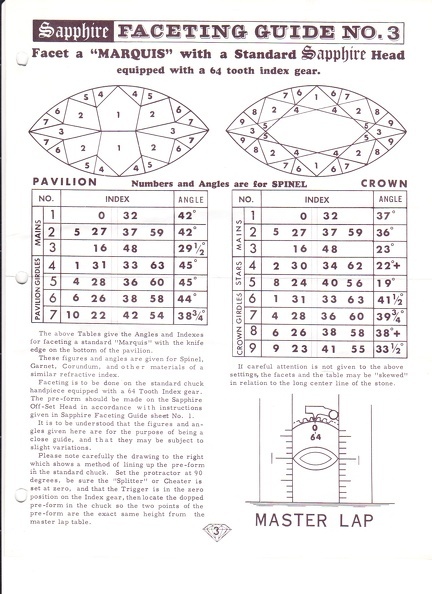 The Diamente cuts both coloured stones and diamonds. 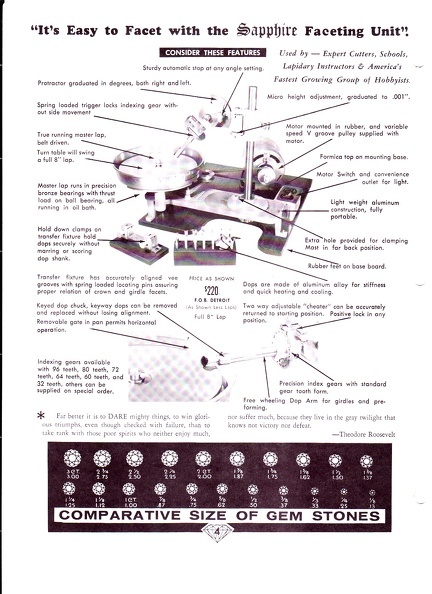 Description: A removeable handpiece faceting machine. Photo Credit: Lee Lapidaries, Inc. 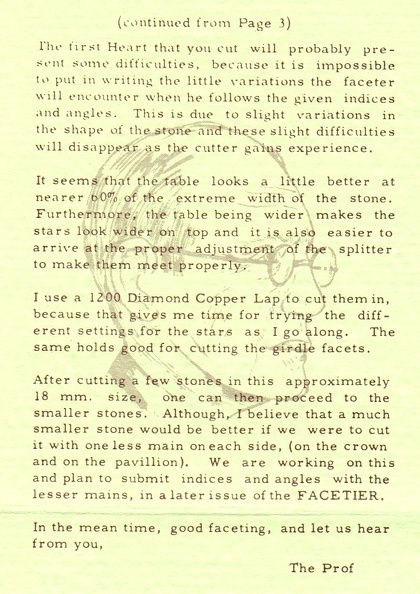 Description: A simple and inexpensive faceter for manually cutting stones. Description: A Korean manufacturer of automated production faceting machines. The contact information is for the US office. Description: Both a portable and table mounted version are available. Description: Mast style machines with a removable handpiece. Description: Commercial faceting machines including a double lap and a six station version. Ed mohs this post is just for you - Mostly. 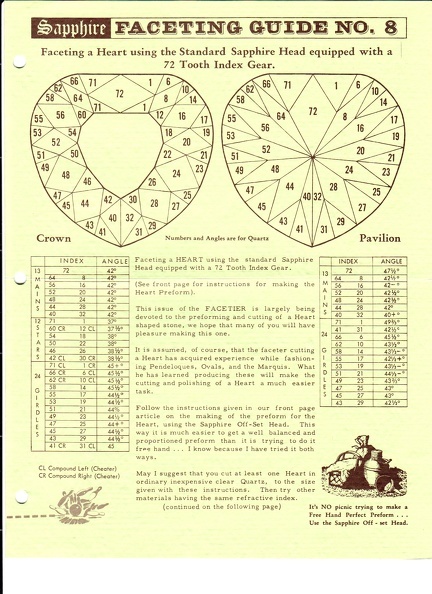 A Quartz Heart with 11 Mains.